This article is about the Kadesh mentioned in the Bible. For the ancient city in Syria, see Kadesh (Syria). For other uses, see Kadesh. Kadesh or Qadesh (in classical Hebrew Hebrew: קָדֵשׁ, from the root קדש "holy") is a place-name that occurs several times in the Hebrew Bible, describing a site or sites located south of, or at the southern border of, Canaan and the Kingdom of Judah. Many modern academics hold that it was a single site, located at the modern 'Ain el-Qudeirat, while some academics and rabbinical authorities hold that there were two locations named Kadesh. A related term, either synonymous with Kadesh or referring to one of the two sites, is Kadesh (or Qadesh) Barnea. Various etymologies for Barnea have been proposed, including 'desert of wanderings,' but none have produced widespread agreement. The Bible mentions Kadesh and/or Kadesh Barnea in a number of episodes, making it an important site (or sites) in narratives concerning Israelite origins. Kadesh was the chief site of encampment for the Israelites during their wandering in the Zin Desert (Deuteronomy 1:46), as well as the place from which the Israelite spies were sent to Canaan (Numbers 13:1-26). The first failed attempt to capture Canaan was made from Kadesh (Numbers 14:40-45). Moses disobediently struck a rock that brought forth water at Kadesh (Numbers 20:11). Miriam (Numbers 20:1) and Aaron (Numbers 20:22-29) both died and were buried near a place named Kadesh. 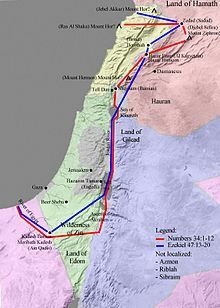 Moses sent envoys to the King of Edom from Kadesh (Numbers 20:14), asking for permission to let the Israelites use the King's Highway passing through his territory, which the Edomite king denied. According to the Jewish historian Josephus, Kadesh (which he called Rekem) is identified with Petra, in Jordan. Kadesh Barnea is a key feature in the common biblical formula delineating the southern border of the Land of Israel (cf. Numbers 34:4, Joshua 15:3, Ezekiel 47:19 etc.) and thus its identification is key to understanding both the ideal and geopolitically realised borders of ancient Israel. Genesis 14:7 "And they turned back, and came to En-mishpat--the same is Kadesh--and smote all the country of the Amalekites, and also the Amorites, that dwelt in Hazazon-tamar." Genesis 16:14 "Wherefore the well was called 'Beer-lahai-roi; behold, it is between Kadesh and Bered." Genesis 20:1 "And Abraham journeyed from thence toward the land of the South, and dwelt between Kadesh and Shur; and he sojourned in Gerar." Numbers 13:26 "And they went and came to Moses, and to Aaron, and to all the congregation of the children of Israel, unto the wilderness of Paran, to Kadesh; and brought back word unto them, and unto all the congregation, and showed them the fruit of the land." Numbers 20:1 "And the children of Israel, even the whole congregation, came into the wilderness of Zin in the first month; and the people abode in Kadesh; and Miriam died there, and was buried there." Numbers 20:14-16 "And Moses sent messengers from Kadesh unto the king of Edom: 'Thus saith thy brother Israel: Thou knowest all the travail that hath befallen us; how our fathers went down into Egypt, and we dwelt in Egypt a long time; and the Egyptians dealt ill with us, and our fathers; and when we cried unto the LORD, He heard our voice, and sent a messenger, and brought us forth out of Egypt; and, behold, we are in Kadesh, a city in the uttermost of thy border." Numbers 20:22 "And they journeyed from Kadesh; and the children of Israel, even the whole congregation, came unto mount Hor." Numbers 27:13-14 "And when thou hast seen it, thou also shalt be gathered unto thy people, as Aaron thy brother was gathered; because ye rebelled against My commandment in the wilderness of Zin, in the strife of the congregation, to sanctify Me at the waters before their eyes.' --These are the waters of Meribath-kadesh in the wilderness of Zin." Numbers 33:36-37 "And they journeyed from Ezion-geber, and pitched in the wilderness of Zin--the same is Kadesh. And they journeyed from Kadesh, and pitched in mount Hor, in the edge of the land of Edom." Deuteronomy 1:46 "So ye abode in Kadesh many days, according unto the days that ye abode there." Deuteronomy 32:51 "Because ye trespassed against Me in the midst of the children of Israel at the waters of Meribath-kadesh, in the wilderness of Zin; because ye sanctified Me not in the midst of the children of Israel." Judges 11:16-17 "But when they came up from Egypt, and Israel walked through the wilderness unto the Red Sea, and came to Kadesh; then Israel sent messengers unto the king of Edom, saying: Let me, I pray thee, pass through thy land; but the king of Edom hearkened not. And in like manner he sent unto the king of Moab; but he would not; and Israel abode in Kadesh." Psalm 29:8 "The voice of the LORD shaketh the wilderness; the LORD shaketh the wilderness of Kadesh." Ezekiel 47:19 HE "And the south side southward shall be from Tamar as far as the waters of Meriboth-kadesh, to the Brook, unto the Great Sea. This is the south side southward." Ezekiel 48:28 HE "And by the border of Gad, at the south side southward, the border shall be even from Tamar unto the waters of Meribath-kadesh, to the Brook, unto the Great Sea." The most common identification of Kadesh or Kadesh Barnea in modern scholarship is with the present-day Tell el-Qudeirat, with most contemporary scholars seeing the biblical references to Kadesh as referring to a single site. The Bible locates Kadesh, or Kadesh Barnea, as an oasis south of Canaan, west of the Arabah and east of the Brook of Egypt. It is 11 days' march by way of Mount Seir from Horeb (Deuteronomy 1:2). By the late nineteenth century, as many as eighteen sites had been proposed for biblical Kadesh. One source of confusion has been the fact that Kadesh is sometimes mentioned in connection with the Desert of Paran (Numbers 13:26) and at other times with the Zin Desert (Numbers 20:1). This discrepancy has been noted by commentators as early as the Middle Ages. Some (e.g., Hezekiah ben Manoah) sought a reconciliatory model, while others (Abraham ibn Ezra and Nahmanides) proposed two separate sites named Kadesh. A minority of recent scholars have continued to maintain a two-site theory, with a western Kadesh in the wilderness of Zin, and an eastern Kadesh in the wilderness of Paran, the latter often associated with Petra, Jordan. The two-site theory also appears to have been held by Josephus and Eusebius of Caesarea. Josephus identifies Miriam's burial site (which the Bible identifies as Kadesh) with Petra. After a period in which researchers identified Kadesh with the similarly-named Ein Qedeis, since 1905 modern Ain-el-Qudeirat in Wadi el-Ain of northern Sinai has been widely accepted as the location of Kadesh Barnea. Several Iron Age fortresses have been excavated there. The oldest, a small elliptical structure, dates to the tenth century BCE, and was abandoned for some time after its first destruction. A second fort, constructed during the eighth century BCE (probably during the reign of Uzziah) was destroyed during the seventh century BCE, most likely during Manasseh of Judah's reign. Two ostraca engraved in Hebrew, dated to the 8th or 7th century BCE, have been recovered there, suggesting Israelite occupation. Excavations at Ain el-Qudeirat conducted by Dr. Rudolph Cohen, former head of the Israeli Antiquities Authority during the Israeli occupation of Sinai following the 1967 war uncovered copious remains of the Middle Bronze Age I period (MBA I or MBI, sometimes known as the Intermediate Bronze Age), which were also found at numerous other sites in the Negev. On the other hand, Late Bronze Age, the conventional time of the Exodus, is unattested in the Negev. In an article in Biblical Archaeology Review of July, 1983, Cohen put forward the suggestion that the Exodus took place at the start of MBI and that the MBI people were, in fact, the Israelites. The idea has not been widely adopted. ^ Brown, Francis, S. R. Driver, and Charles A. Briggs, eds. (1907). A Hebrew and English Lexicon of the Old Testament. New York: Houghton Mifflin. pp. 871-874; Koeler-Baumgartner 3:1072-1078; TDOT 12:521-545. ^ Charles Trumbull (1884). Kadesh-Barnea: Its Importance and Probable Site, 24-25. ^ Kadesh Barnea (קדש ברנע), whence the spies were sent to search out the Land of Canaan, near Canaan's southern border, is identified by Eusebius (Onomasticon) and by Jacob Sussmann as being Petra in Arabia, the southernmost extent of the boundary of Israel in the 4th century BCE (See: Jacob Sussmann, The Boundaries of Eretz-Israel, Tarbiẕ (Academic Journal), pub. by: Mandel Institute for Jewish Studies, Jerusalem 1976, p. 239). Cf. Josephus, Antiquities of the Jews (iv.vii.§1) who names five Midianite kings who formerly governed the region, but by the 1st century CE the place had already come under the possession of the Arabs: "Of these there were five: Ochus and Sures, Robees and Ures, and, the fifth, Rekem; the city which bears his name ranks highest in the land of the Arabs and to this day is called by the whole Arabian nation, after the name of its royal founder, Rekeme: it is the Petra of the Greeks" (Loeb Classical Library). Others have identified Kadesh Barnea, not with Petra, but with Ein el Qudeirāt, or what is also called Tell Qudeirāt near Quseimah in the region of the central Negev, now belonging to Egypt (Ben-David Ben-Gad Hacohen, 1998 - pp. 28–29), arguing that Reḳam (Petra) in Mishnah Gittin was not considered the Land of Israel, while Reḳam of Ǧayāh is listed as a frontier city of the Land of Israel. (See also Y. Aharoni, "Kadesh-barnea," Encyclopaedia Biblica, 7:39-42; R. Cohen, "Kadesh-Barnea," New Encyclopedia of Archaeological Excavation 3:843–847). ^ Zecharia Kallai, "The Southern Border of the Land of Israel — Pattern and Application", Vetus Testamentum XXXVII 4 1987, 438-445. ^ a b Yigal Levin, Numbers 34:2-12, "The boundaries of the land of Canaan, and the empire of Necho," Journal of the Ancient Near Eastern Society 30 2006, 65. ^ a b C. H. J. de Geus (1977). "Kadesh Barnea: Some Geographical and Historical Remarks". In Hendrik Antonie Brongers (ed.). Instruction and Interpretation: Studies in Hebrew Language, Palestinian Archaeology and Biblical Exegesis: Papers Read at the Joint British-Dutch Old Testament Conference Held at Louvain, 1976, from 30 August to 2 September. Brill Archive. p. 58. ISBN 90-04-05433-2. Anyone who is familiar with the Exodus-literature will know that Kadesh Barnea is practically always identified with ʿAin el Qudeirat and not with ʿAin Qdeis, notwithstanding the fact that the ancient border inscriptions always mention Kadesh Barnea first. ^ Charles Trumbull (1884), Kadesh-Barnea: Its Importance and Probable Site, 303. ^ "A very few modern scholars have claimed that there were, indeed, two sites by the name of Kadesh." Yigal Levin, Numbers 34:2-12, "The boundaries of the land of Canaan, and the empire of Necho," Journal of the Ancient Near Eastern Society 30 2006, 65. ^ Isaacs, Samuel Hillel. (1917). The True Boundaries of the Holy Land. ^ Hacohen, D. (2002) "Kadesh and Rekem, Kadesh-Barnea and Rekem-Geah." In Y. Eshel, Ed., Judea and Samaria Research Studies 11 (Ariel). p. 25-40. Hebrew with English Abstract. ^ Wenham, Gordon J. (2008). Numbers. p. 152. ^ E. Klostermann, Eusebius—Das Omnosticon Der Biblischen Ortsnamen (Hildesheim, 1966), 113. This page was last edited on 21 March 2019, at 11:04 (UTC).